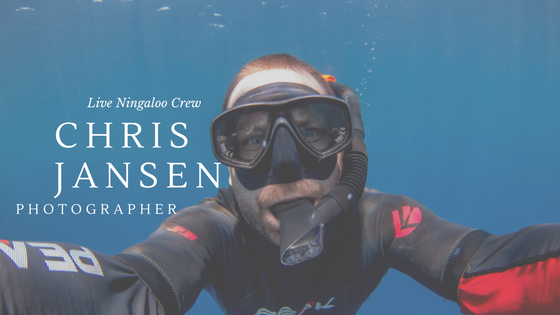 Chris Jansen is our photographer for the 2017 whale shark season. Our season is about to start, EKEKEKEKEKKKKKKK on the 26 March and it seemed fitting to highlight the Live Ningaloo crew for anyone interested. 2. He’s had a variety of experiences – we will take the liberty and say, Thanks, Kerry! The funniest bit of the entire afternoon for me was learning his reason for getting a teaching degree. He told me he already had an IT degree and stayed longer to get his teaching certificate because he wanted to spend more time with Kerry – his girlfriend, now wife…Chris is like that, though, once he makes a decision, he’s in. Internally I jumped for joy because the gut check we took when we hired Chris came full circle at that moment – we chose right. Helping people out is what Murray and I just do, and it’s great to have someone on your team whose caring chip is alive, well, and active – he’s part of the club already! Yahoo. Serious note, though – Chris is no joke – he was exposed (ha) to photography at a young age. The adventures he’s has taken with Kerry have given him the opportunity to continue to hone his craft all around the world, and he’s now dedicated himself full time in 2017 with us in tow – we are excited to share the journey with him. I can’t possibly pack Chris into one blog post. He has depth that goes beyond the 600 words I try to keep these suckers to each week. Hopefully, it piques your interest to dig in and get to know him a bit whilst on our tour. Check out the Our Tours on our website – you’ll find all the tours you can book there. Chris’ dad, Jack is a fine art land based photographer, and you can learn about Jack on the Coiro Bay Camera Club website. He originally came to Exmouth WA in 2009 and spent a fair bit of that year obtaining his dive masters and enjoying the area. He and Kerry decided they had to come back, LUCKY US! He’s diligent and patient with his craft, spending gobs of time in winter water in Victoria to get the captures of a lifetime. He loves teaching, especially teaching photography. 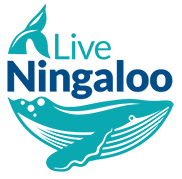 He is keen to give anyone pointers and learn from others as well – Exmouthian’s this means you! When he was teaching IT and Maths to school aged children, he made a point to show that being a well-rounded person with diverse experiences is important. Enter – nerd + dive master + photography lover = awesome sauce. He was the only individual who contacted us and asked to have a conversation with us before sending in his resume. He stuck out to both Murray and I because he took the time to learn about Live Ningaloo, and he wanted us to know him a bit before asking for a job – it left a massive impact on us. We are lucky we nabbed him for the season, and we hope that you continue to follow his work, he’s a star!